Dr Sarah Dietz, July, 2016: The renewed interest in the shared history of Marki and Bradford is certainly a credit to the enthusiasm of the Marki-Pustelnik-Struga History Group, although the romantic portrayal in Bogusława Sieroszewska’s play is very far from historical fact. In 1883 the Briggs brothers, formerly of Briggella Mills in Bradford, established a large worsted factory and workers’ community in Poland. To cement their position in Warsaw society, the Yorkshiremen both married daughters of local industrialists. 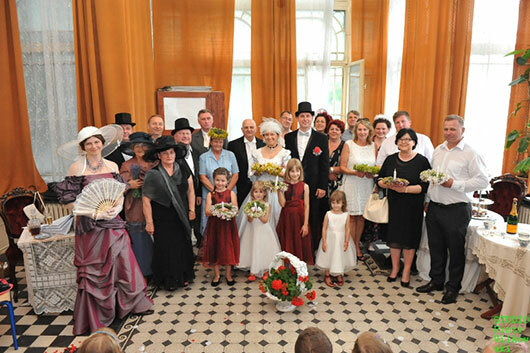 These “arranged” marriages were consecrated with minimal ceremony, not in church but in the offices of the British Consul at Warsaw and it should be accepted that the brides were less of a prize for the young men than the strengthened business relationships with their newly-acquired fathers-in-law. Indeed the Briggs spoke no Polish so communication with their new wives would have been somewhat challenging! The play currently being performed in Marki entertainingly highlights some of the cultural differences between the British and Polish, but in a modern context. Nineteenth-century Yorkshiremen did not wear wedding rings; the fashion began during the world wars and did not become more general until quite recently. Similarly the portrayal of the industrialists eating cucumber sandwiches and singing sentimental songs about their nannies is entirely uncharacteristic; the Briggs were self-made men who grew up in a modest servantless home. Boguslawa Sieroszewska writes: This June the town of Marki in Poland, also known as the19th century second edition of Saltaire, celebrated Midsummer Night with its West Yorkshire history in the background. The highlight of the summer festival was the premiere of the play "The Wedding of the Briggs" by Bogusława Sieroszewska, promoting in Marki the Yorkshiremen, the Briggs brothers of Briggella Mills, Bradford. This time the amateur actors, the members of the Society of Marki-Pustelnik-Struga staged for the local audience the historic wedding of Mr Alfred Briggs of Bradford and Miss Augusta Schulz of Warsaw conducted by British Consul Henry Grant. History has it that by the time of the wedding in 1886, as a co-owner of the newly built textile mill in Marki, Alfred Briggs had already been involved in developing the most modern spinning factory in Eastern Europe called Bradford Mills and the adjacent model industrial community in Marki in the previous three years. The local workers were provided with housing, school, chemist's, shops, later even church. The Marki play was not only very informative, rekindling interest in the local history, but also proved to be a lesson on the English language and Yorkshire wedding customs. Marki people saw an English wedding with bridesmaids and the Best Man making a witty but also very educational speech, pointing out to the differences between English and Polish wedding customs. 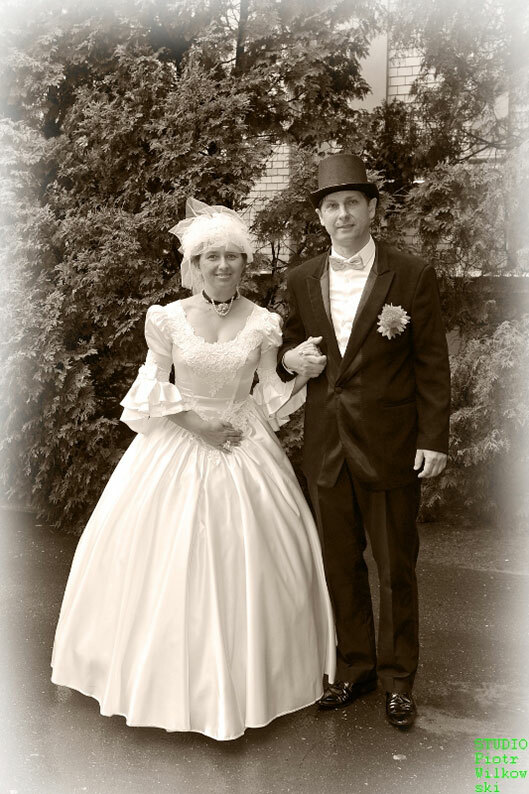 For example, the custom of wearing the wedding ring on the left hand in England and on the right in Poland or the custom of wedding dances in Poland. During the play there was a three-tier wedding cake with the white marzipan icing served to the audience and, most importantly, containing a fake, but still very beautiful, sapphire and diamond ring hidden in the cake for the wedding guests to find for good luck. 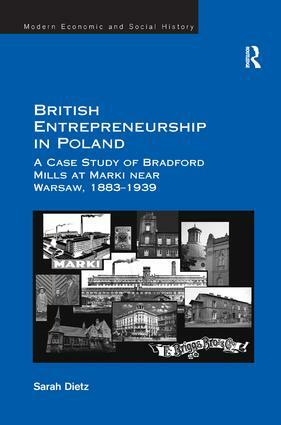 The play was inspired by Dr Sarah Dietz' earlier scientific publication on the spinning history of Marki released in June 2015 (British Entrepreneurship in Poland. (A Case Study of Bradford Mills at Marki near Warsaw, 1883-1939) Although Dr Dietz of Ilkey insists that Alfred Briggs' wedding was more of a business contract than a love based matrimony, this Midsummer Night in Marki provided the local audience with a large dose of romance. The romance revolved around the play version of the English wedding of the Briggs, but it was also a very important ingredient of a newly revived old Polish custom of throwing field flower wreaths into the river and making love wishes while doing so. Due to widespread popularity, the play about the famous Yorkshiremen will be staged in Marki twice more this September.